This has been another busy week at S2C with two new groups getting underway. After a break the Creative Writing returned with Maggie Howe taking the lead. We also started running sessions for Unity as part of their programme dealing with addiction. In the coming week the Ceramics project gets underway with Lakeland Arts and Emily the artists. A group of our volunteers and service users will spend ten weeks on a collaboration to produce a work for display at Blackwell. We are also looking for people to submit work for our next exhibition. You can submit a single piece or have a few up to a couple of metres of wall space. Email a short piece about yourself and images. The second of two sessions on relief printing or collograph. Those who had completed a relief collage last week were rolling ink onto it and printing using a printing press. People used a range of colours and built on what they had already done by overprinting or creating new collages to print from. Those who hadn’t finished or created a collage last week were able to do so this week and they dried in time to print with them. Space2Create is running sessions on Tuesday afternoon 2-4 for Unity. In this first week we looked at Mono printing. Mat led the session and owed simple mono printing techniques starting with inking a plate and making marks. The group then selected images from magazines and used these to create more complex images. Some great work here. In the Thursday group today, we tried an art form called quilling. Quilling or paper filigree involves the use of strips of paper that are rolled, shaped, and glued together to create decorative designs. The paper is rolled, looped, curled, twisted and otherwise manipulated to create shapes. Participants created various beautiful flower, heart and bird forms which we will continue with next week. With a new C3 member on board, we talked about exploring ideas of working with large and small graphic panels using different materials: for example, graphic yarn bombing projects and wrapping objects in different media. We were discussing using traditional craft materials to tell a story: for example, tapestry-style banners using printed materials with embroidered graphics. We now have a website which is being tweaked, and Lloyd has produced further comic panels for his ongoing comic. We are still working on variants for the group logo, with Facebook, Twitter and Pinterest pages to follow. The group was inspired by the collection of worn and see washed glass Mat brought back from the North east coast. The grouup looked at imagining what the glass might of been, its journey and adventures. They then started to create mixed media pieces based on this. A week of many different things! Looking at the activity that has been going on this week at S2C it shows just how varied a creative mix we produce. From printing, to collage, to wire sculpture, to Chagall – all in one week! And lets not forget the DeafArt group and their fab work as well as the Cumbria Comic Collective who are getting now with more people finding out about it. The coming week also sees some new things happening. On Tuesday afternoons our volunteers will be running sessions for the Unity organisation. On Wednesday morning a new Creative Writing group gets under way with Maggie Howe taking the lead. Keep an eye out for Open Studio sessions too, when we have volunteers free to open up the Unit for people to come along and work on their own projects. In the first of a two-part session, participants began to experiment with relief printing. We created a collage of materials on a cardboard base, using shapes and textures such as string, buttons, raised wallpaper, rice and jigsaw pieces. These raised pieces will form what is known as the positive area, and the plain base the negative. Whilst these look artistic in their own right, we hope to roll ink onto the positive areas in the next session, and to create some decorative patterns from the prints. We had quite a varied session today, where we took three different objects onto the ward to use as inspiration. The objects were children’s toys: a spaceship, a stuffed alien and a monkey. We also took along a toy-making book (sock monsters) for extra creative input. Everyone picked a medium to work in and we quickly produced a mixture of drawings (pencils and felt tips), paintings and collages. This week the group finished up wire and beadwork sun- catchers. One participant finished up her wire and beadwork dream catcher. The finished pieces were full of individuality and were beautifully eye catching. Still on the sun theme , one participant created a collage piece of a sunrise made from linear strips from magazines and music manuscript. The group, led by Jane, looked at the artwork of Marc Chagall concentrating on his circus pictures. Using this as an inspiration nthe group crerated their own pictures using a variety of media. This week was much shorter due to Easter so we only started on Wednesday! 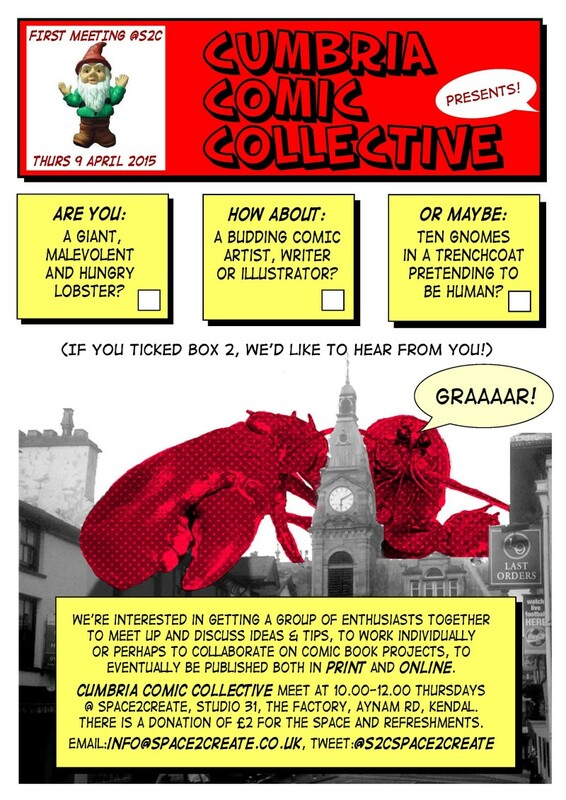 The new Cumbria Comic Collective got under way on Thursday and we all had a good natter as everyone caught up after the Easter break. This weekend 11th and 12th April is another Open Studio weekend at the Factory so people can come along again to see the Exhibition in our Gallery. In today’s ward session, we started by making a flotilla of origami boats out of maps. We then moved on to create some ‘invented worlds’: starting with a base layer of torn maps, we embellished in various ways and with various media to end up with some radically different interpretations of the original images, all of postcard size. A satisfyingly creative session. Clare led todays session with an appropriate activity given the appearance of the sun today! The group looked at making Suncatchers. These are designed to hange, being decorated they catch the sun and reflect, maybe even creating interesting shadows. These were made by bending wire around objects to shape it then decorating them with an assortment of beads and other items. Will look great hanging outside when they are finished. In our first comic group session we talked about how the group could develop and what kind of work we want to produce in future. We’re keen on thinking and working outside of traditional comic book topics, but superheroes, sidekicks and zombies can still get a game. The more variety, diversity and energy the better, lets create a creative local scene! Lloyd demonstrated a mini-comic book which is printed on one sheet of A4, cut and folded to create an 8-page DIY comic project…. We set up a template for the design and will stick it on our website or downloading next week, for people to create their own comic books. The group were thinking about mixing colours. Often when painting the group has struggled with acrylic colours getting various shades and tones. Today each person picked a colour and experimented with mixing different combibnations to change them. We created simple abstract pics just to see if we could get different blocks of the same colour with slight variations. We all found it a useful experiment to help us with future painting projects. Ant was creating an image in pen and Kate was starting a paper sculpture. 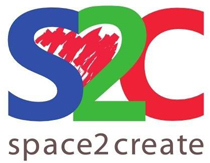 Experienced Creative Writing teacher Maggie How is offering a series of writing sessions at Space2Create on Wednesday mornings. (Dates to be confirmed). The sessions will focus on individual needs and will give people the opportunity to explore writing for fun through a series of guided exercises, as well as looking at writing for wellbeing.People may wish to share their writing with others, or just use the time to listen to others and write in their own time.The session is all about sharing and growing in terms of writing skills and communicating in general. Often, just taking time out to focus on writing and putting down thoughts and ideas on paper can be very enlightening. Maggie has experience in writing short stories, poetry and journaling, and will be there to help others take part in these exciting activities. She has taught creative writing in Colleges of Further Education in the past. Often it can be hard to know where to start, so through a series of prompts and ideas, Maggie will help you to get going and have fun with story telling, poetry making and journaling. People who already experienced in writing are welcome to join the sessions to share their work and to perhaps get new ideas to expand their writing. 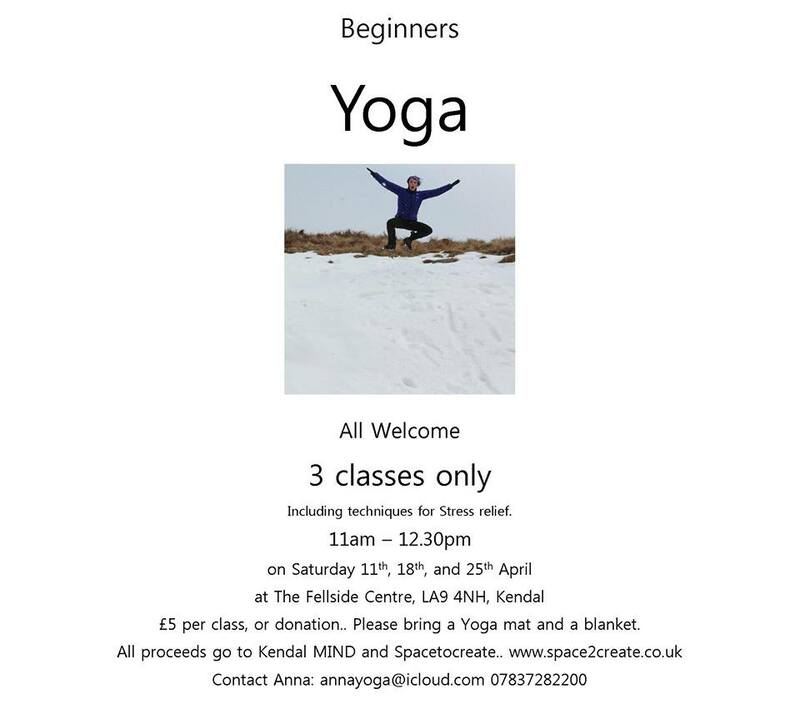 Anna Jordison has kindly offered to share proceeds form running Yoga sessions at the Fellside Centre between Space2Create and South Lakeland Mind. Please see the poster for dates and times. If you get chance then do go along and support two great charities working with vulnerable people in the local area. Easter break and a gentle week. After the mayhem of the new exhibition and Open Weekend we had a more calm few days. We stopped sessions from Wednesday and will start up again next Thursday. The Open Weekend was a massive success in many ways. Over the two days we had over 300 visitors to the gallery, sold four pictures, made some very useful and important links with organisations and artists and once again raised our profile hugely. A big thank you to all who came and supported as well as to those who helped out. Just when you thought you could relax there is another open weekend at the Factory next week, 11th and 12th April. Once again all the artists and galleries will be open to the public from 10 till 4 on Saturday and Sunday. If you missed out last time then do come and see what you missed! A really quiet session as the Easter holidays hit and most of the group went off with Emilie Taylor to view her exhibition at Blackwell and discuss the ceramics project. The sessions will start properly at the end of April so if you couldn’t make it today we will sort out the dates with you. The rest of us chatted, chilled and did some collage based around the work of Peter Blake. It was all a but low key! On the Kentmere Ward the group were creating daffodil images using a variety of techniques involving collage and torn paper. Very seasonal. In recent weeks the DeafArt group have been busy folding paper to produce this amazing paper sculpture. It looks truly stunning.